I made a fun little discovery last week while at Bulk Barn. 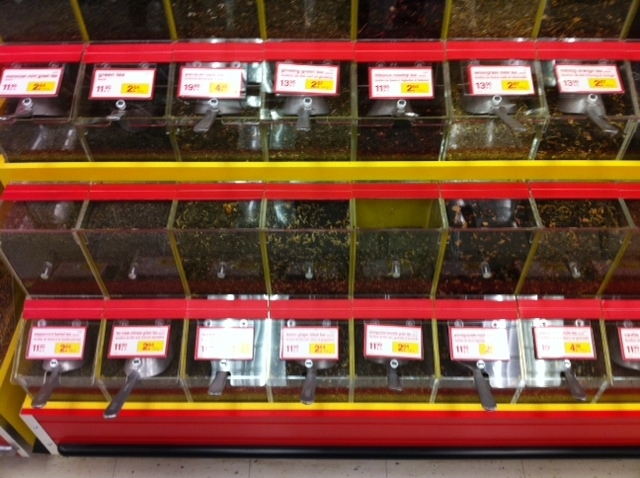 Bulk Barn (a bulk superstore for those who don’t know of it) sells loose tea! I cannot comment on the quality, as I did not pick any up, though without a doubt it would be higher quality than any teabags you’d find at the grocery store. Click here to see some of the varieties Bulk Barn offers. It’s hard to tell in the below photo that I took, but the tea is very low in cost, ranging from about 2 – 5 dollars for 100 grams (1.8 oz) worth. Have you tried any loose tea from Bulk Barn? Let me know what you think! « Birds like tea too! I have tried all the loose teas from Bulk Barn. Great quality and great taste i must say. The only concern I have is it organic 100% pure or sprayed chemically grown? I’m pretty sure some of the tea flavours are labeled organic from what I recall. I haven’t been to bulk barn in a while, so will have to check the next time I’m in a store! My concern though is that the teas are constantly being exposed to oxygen, which will reduce some of the health benefits that you’re getting out of the tea.